I have cooked many British types of comfort food at work. This prawn and fish laksa though, is what I would call Asian-style comfort food. This is my cup of tea, the kind of comfort food that I prefer. I abosolutely love it! I am making my own type of laksa paste. It is not difficult to do and once it is done, the rest of the dish doesn’t take very long to cook. And as rich and creamy as it may look, this is quite a low-calorie recipe. The only fat I’m using here is coconut fat – both a bit of coconut oil and coconut milk. Coconut fat is a very nutritious type of fat which can help to promote weight loss and which won’t raise cholesterol levels (see Nutritional Information). 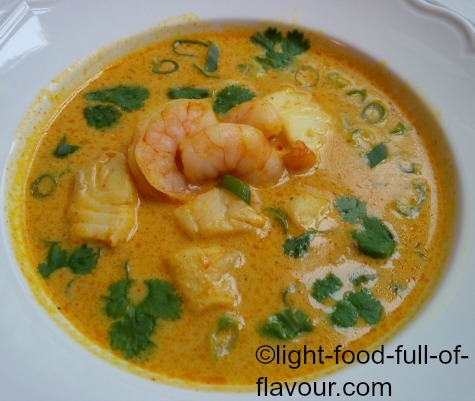 I am serving my prawn and fish laksa without any noodles (fewer calories that way). 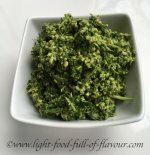 I add a fair amount of chopped red peppers (bell peppers) and sliced sugar snaps or mange tout instead and top it all with sliced spring onions and coriander. But you can of course add any noodles of your choice. Tip: Coconut oil is by far the healthiest type of fat to cook your food in. It is sold in most health food shops. I use it every time I cook Asian-style food. Unless it’s very warm, coconut oil is actually solid. 1. Place all the ingredients for the paste in a food processor and blitz until you’ve got a smooth paste. Place the paste in a medium-sized pan over a moderate heat and stir and cook the paste for about 2 minutes. 2. Add the fish stock, coconut milk and fish sauce to the pot, bring to a simmer and simmer for 10 minutes. 3. Add the prawns and fish to the pot. Bring back to a simmer and cook for about 3 minutes, until the prawns are cooked through and the fish is cooked. Add the lime juice to the pot. 4. Divide the prawn and fish laksa between 4 bowls and top with the vegetables.